The Jones Bridge was often photographed alongside the Bureau of Posts, Telegraphs and Public Works (Post Office Bldg.) and the Metropolitan Theater. All three structures are masterpieces by Arch. Juan Arellano. National Geographic Magazine, September 1930. 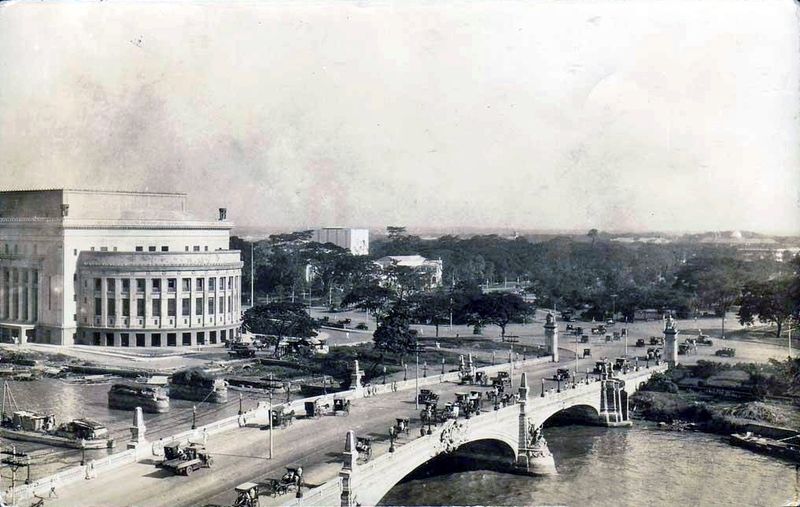 If there is one particular structure that exuded elegance and sophistication during the good old days of pre-war Manila, this bridge that crosses the Pasig River would definitely be on the top of anyone's list. 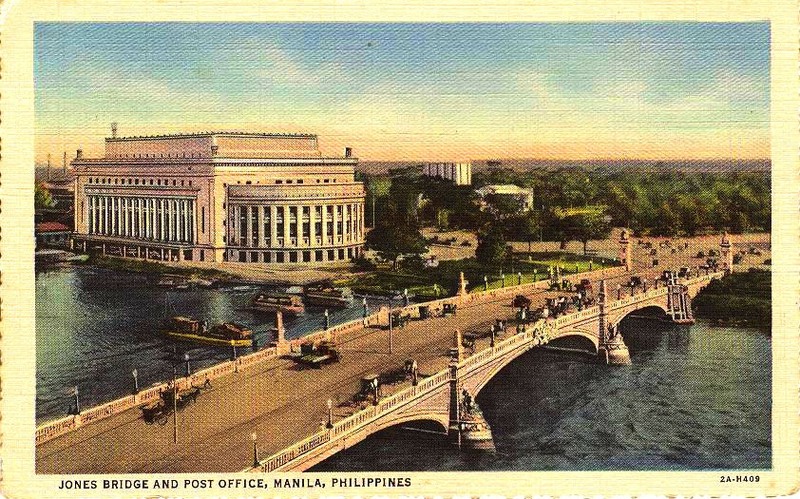 A vintage postcard showing how picturesque this area was before the war. The William Atkinson Jones Memorial Bridge or more commonly known as the Jones Bridge is a bridge that connects the Binondo district on Calle Rosario (Q. Paredes St.) with Calle Padre Burgos (Padre Burgos St.) just outside the walls of Intramuros. The bridge honored former Virginia representative, William Atkinson Jones, the principal author of the Jones Law or the Philippine Autonomy Act of 1916. Learn more about the Jones Law here. 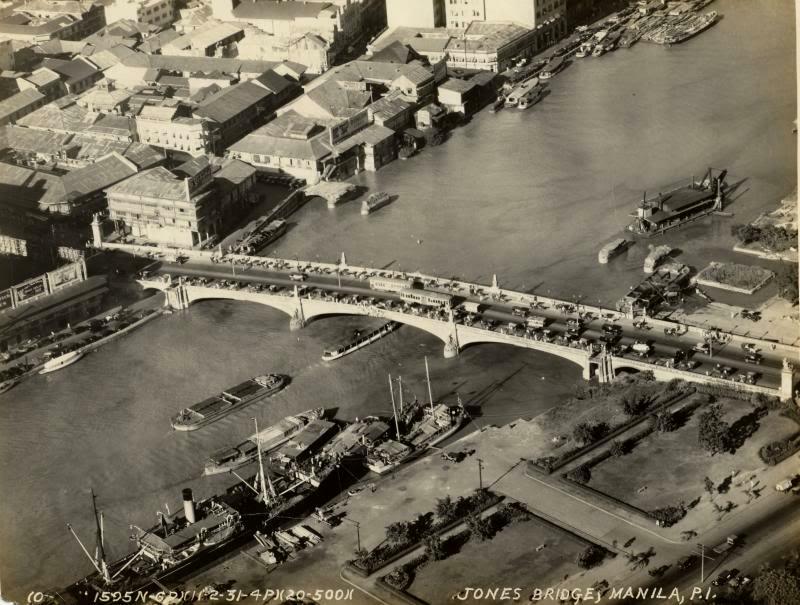 Aerial view of the Jones Bridge, c1920s. You can still see the foundations of the Puente de Espana just a few meters upriver from the Jones. 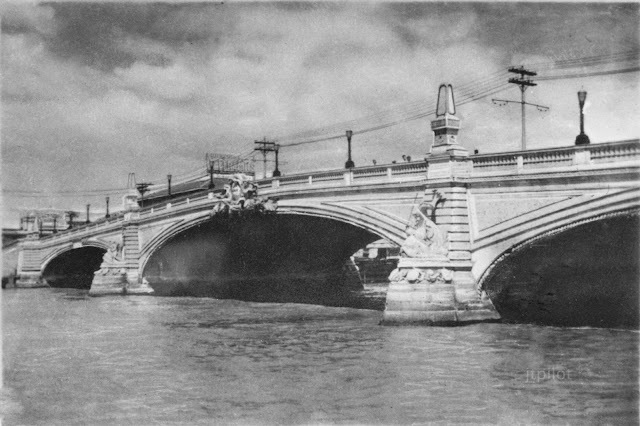 The Jones Bridge replaced the Puente de Espana (Bridge of Spain), built by the Spaniards in 1876. When the Americans took over, this bridge was still working perfectly but eventually, the bridge became weak and was damaged beyond repair. A replacement was needed as soon as possible. 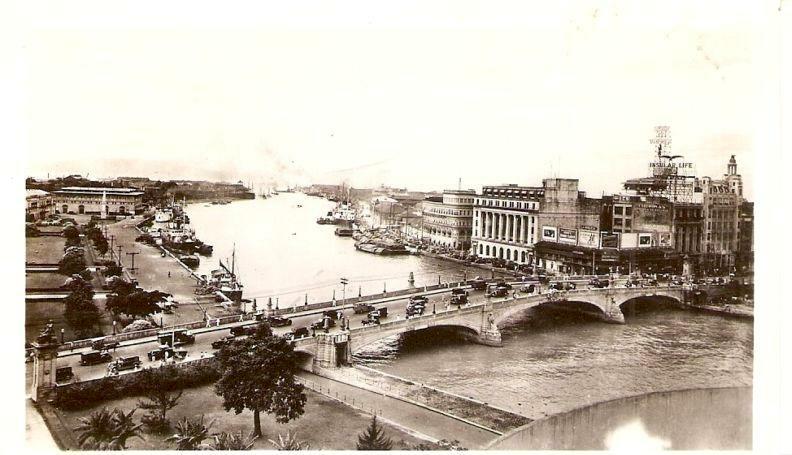 As part of Daniel Burnham's planning and beautification of the city, Burnham's plan gave importance to the Pasig River and to the canals surrounding it. 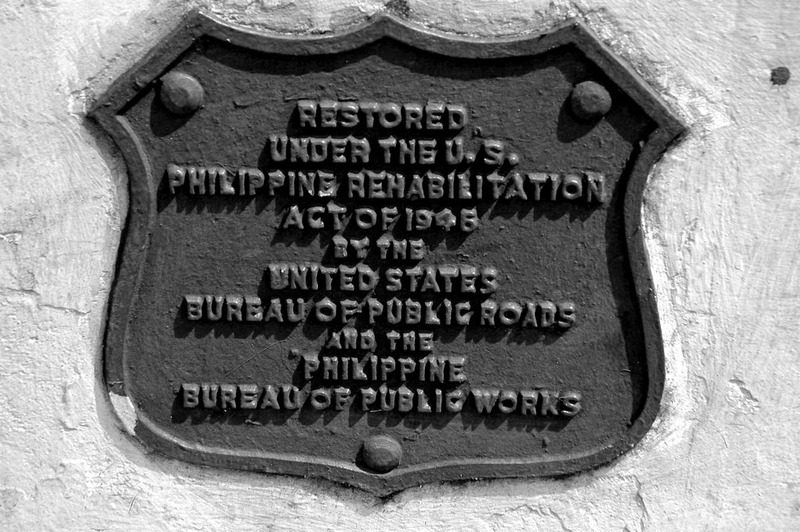 The Bureau of Public Works strongly implemented this plan led by another prominent American architect, William Parsons. Burnham took inspiration from Paris' Seine River and Venice's stunning canals. 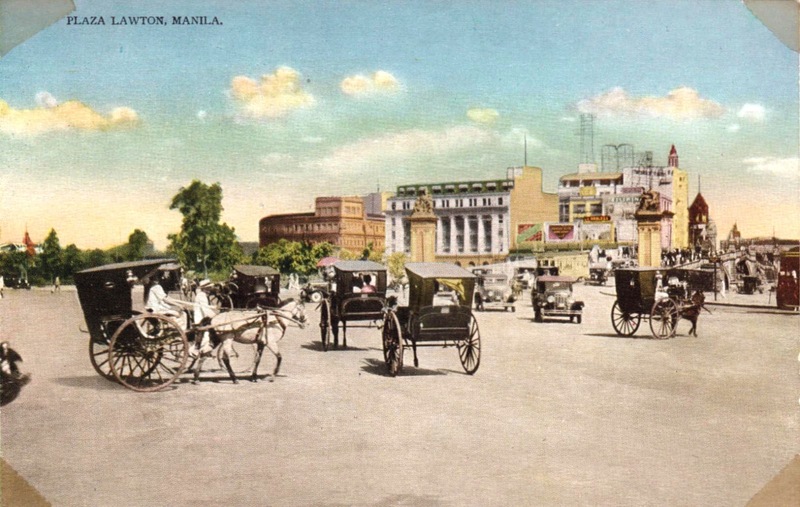 He envisioned Manila to be a combination of both Paris and Venice. 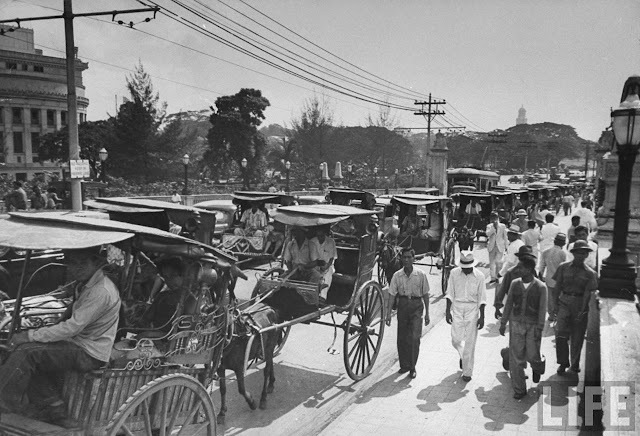 As part of the Jones Law of 1916, priority was given to Filipino architects in designing new buildings for the city. Arch. 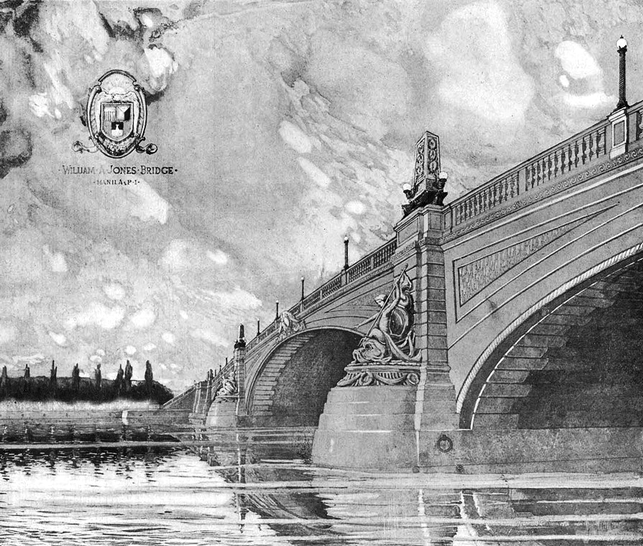 Juan Arellano was the chief designer and architect of the neoclassical Jones Bridge and he surely did not disappoint. 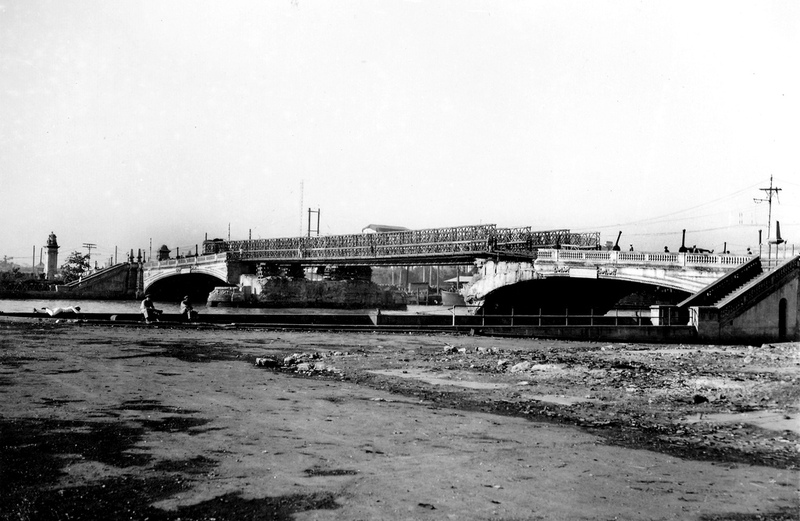 Construction of the bridge was in full swing in 1919 and was completed in 1920. It was inaugurated in 1921. 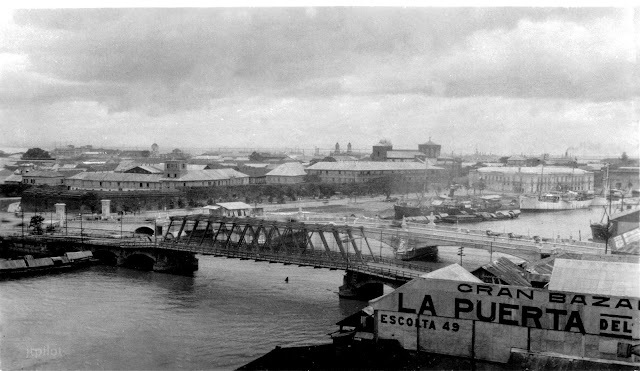 The newly completed Jones Bridge beside the Puente de Espana, c1920s. The Puente de Espana was already being slowly demolished. That steel bridge served as a temporary bridge while the construction of the Jones was being undertaken. That is not the Puente de Espana's original design. Most photographed angle of the Jones Bridge. This picture definitely gives off a Parisian vibe. An illustration of the Jones Bridge showing the figures on the bridge's piers. The figure on top of the bridge's center arch showing its intricate details. 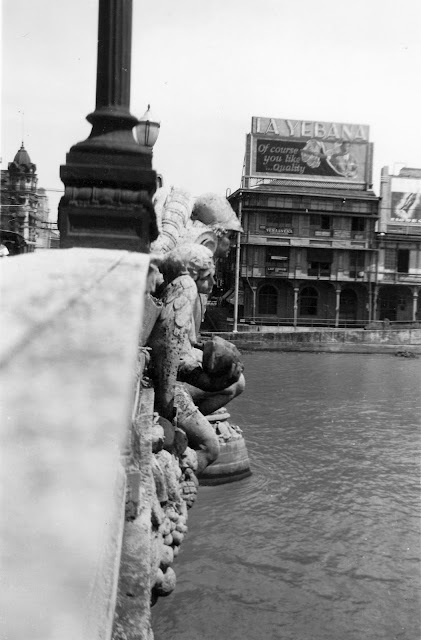 Out of all the many features that make up this bridge, I think the most striking parts are the four statues on both ends called La Madre Filipina (The Filipina Mother). One of the statues of the La Madre Filipina. 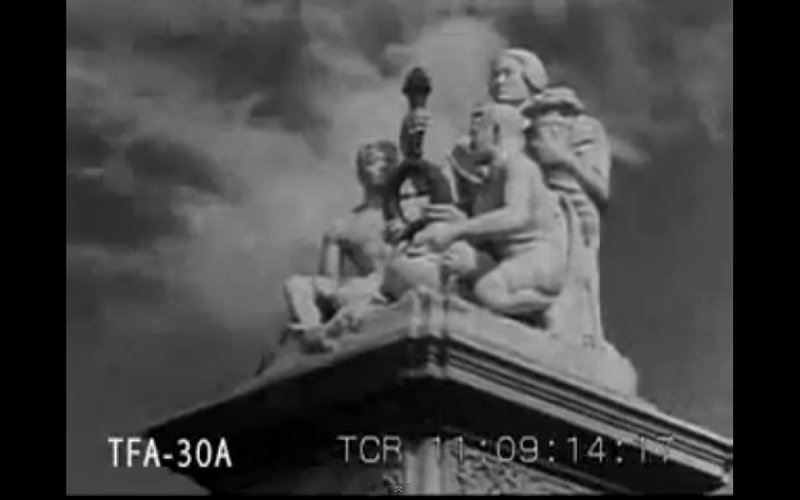 I believe that this particular statue is the one we see in Luneta today. View of the Jones Bridge from the Post Office Building. The La Madre Filipina greets you as you enter the bridge from Plaza Lawton. 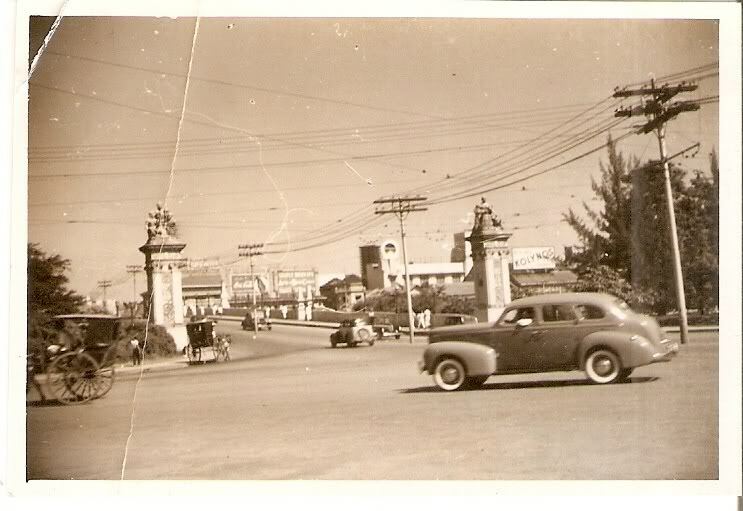 Another view showing the bridge's entrance from Plaza Lawton. A vintage postcard showing the calesas entering the bridge. The Jones Bridge upon entering from Plaza Moraga. 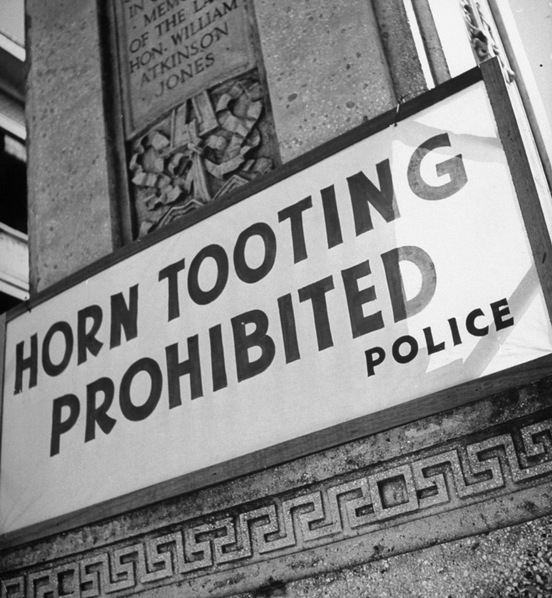 "Horn Tooting Prohibited", a sign in one of the bridge's pedestals, 1941. 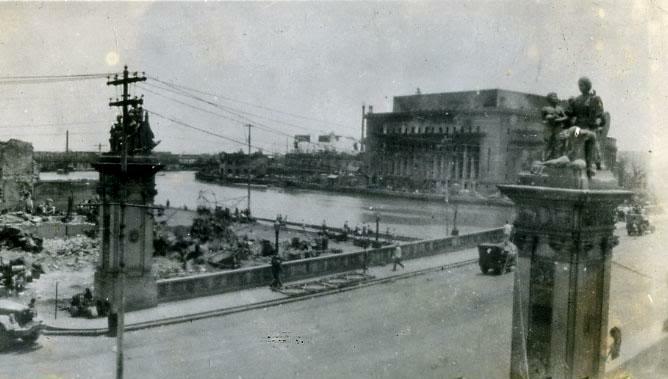 View of Plaza Lawton from the bridge, 1941. 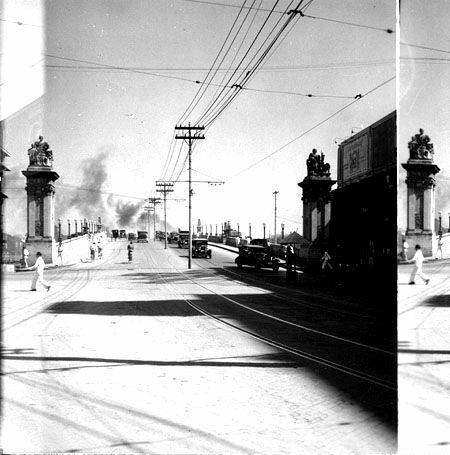 View of Plaza Moraga from the bridge, 1941. The Second World War marked the untimely destruction of the once beautiful Jones. 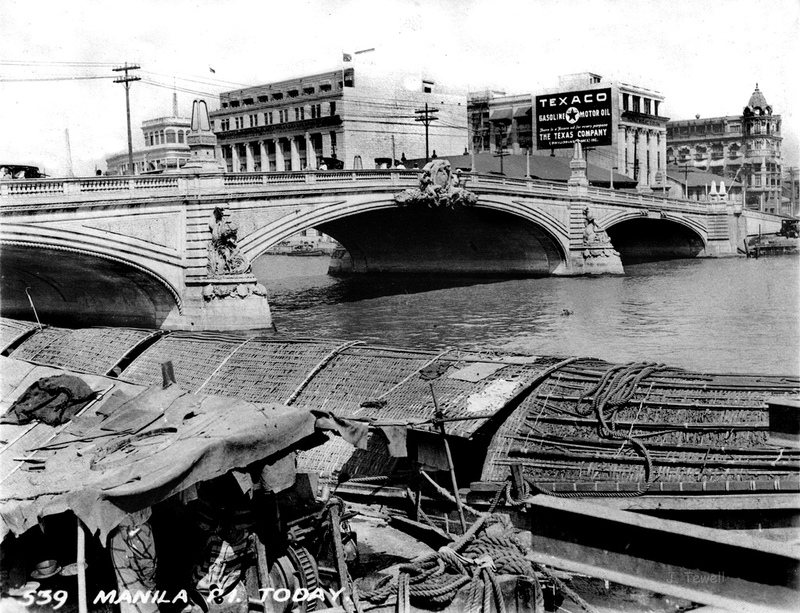 It was bombed by the Japanese Imperial Army during the Liberation of Manila in 1945. The Jones Bridge was reconstructed with funds from the American Government under the Philippine Rehabilitation Act of 1945. The bridge still carried its original name but the original design was not applied. Functionality was chosen over aesthetics. The new design was simpler and quite banal, a far cry from Arch. Juan Arellano's vision. 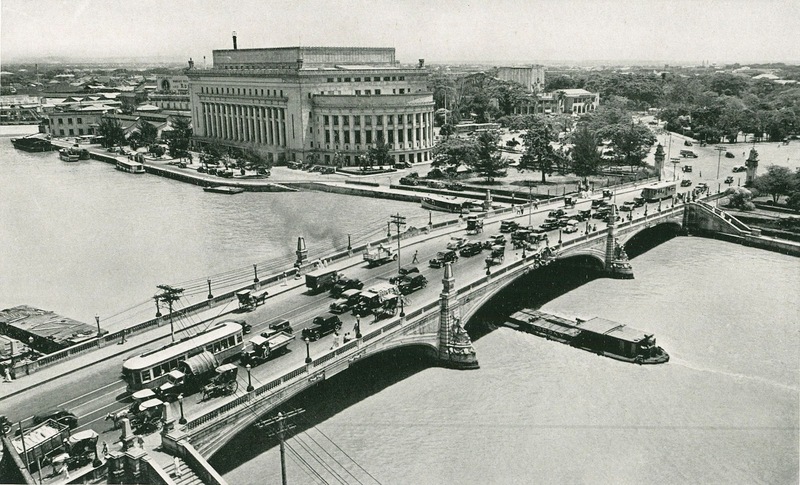 A temporary Bailey bridge spanned the Pasig River, post-war Manila. 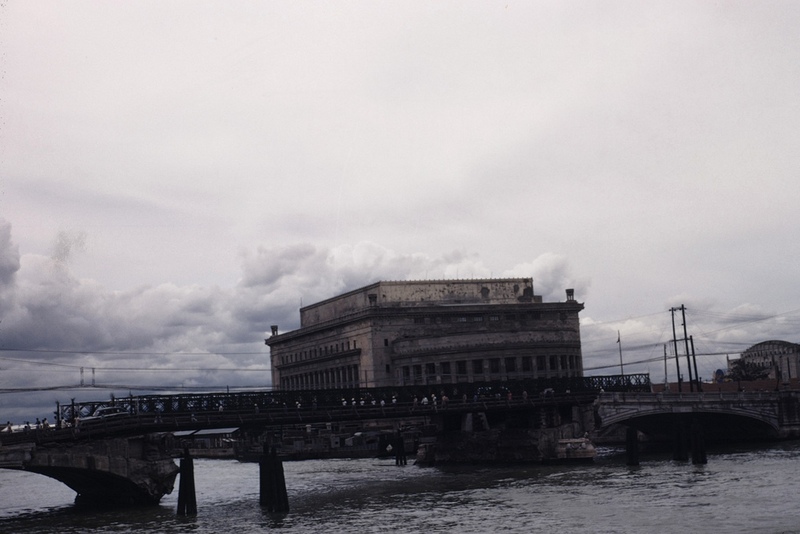 A colored photograph showing the remnants of the Post Office Bldg. 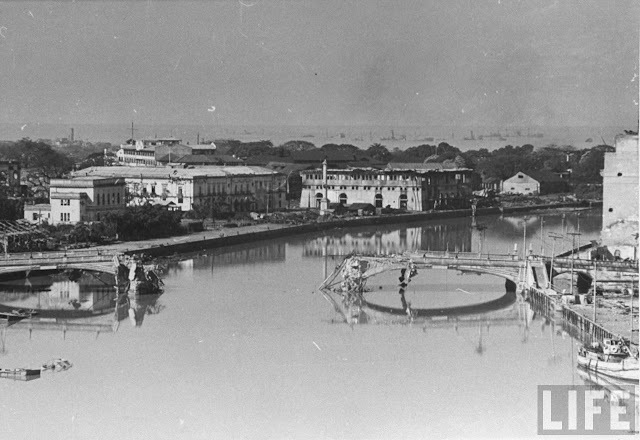 and the Bailey bridge that temporarily connected the Pasig. The Metropolitan Theater can be seen on the right. The two La Madre Filipina statues still intact while entering from Plaza Moraga. 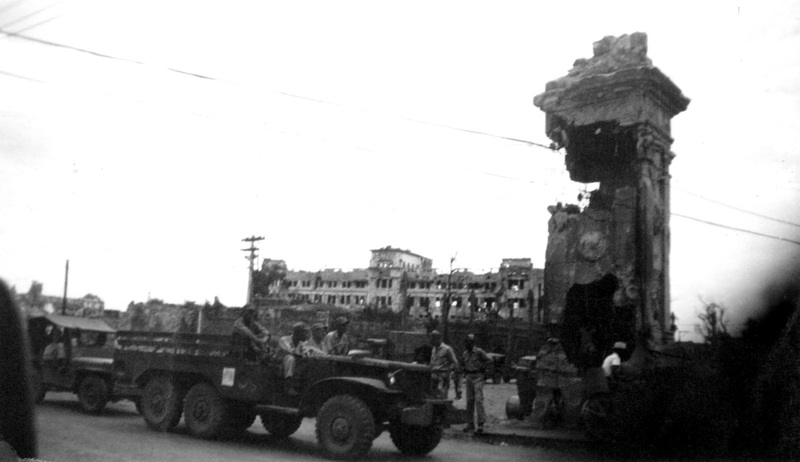 Showing the damaged pedestal upon entering the bridge from Plaza Lawton. 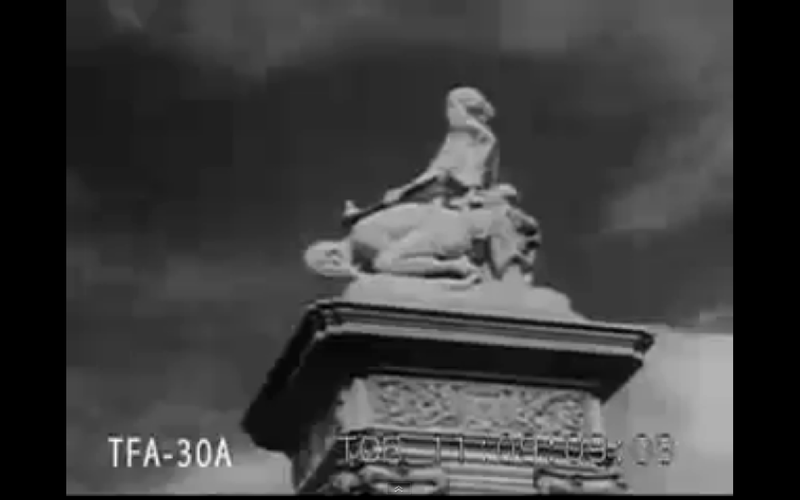 This is probably the fourth statue that is missing. The building in the background is the war-torn San Juan de Letran in Intramuros. The Jones Bridge represented so many things. It symbolized the Philippines' development as an emerging nation, it showcased Filipino artistry and more notably, it represented American rule and influence on the Philippines. It was a bridge that every Filipino should be proud of. The fate of this bridge is uncertain. One can only dream of the complete restoration of the pre-war Jones Bridge back to its former glory. This dream is not impossible and I believe that in the future, with the right management and the proper time, this bridge will be given back its old grandeur and splendor. *Special thanks to Mr. Paulo Alcazaren's article "Jones Bridge Diary: The link to a romantic past" published in 2001. Better if you have present photos for us to compare. Nonetheless, it's great! Very nice photos. It was good that you shared it for all to enjoy. Notice the historic tranbias in their resplendent green and yellow crossing that wonderful bridge. Amazing! probably the loveliest bridge we've had in the Philippines. Both La Madre Filipina statues can be found at the entrance of the main Court of Appeals building in Ma. Orosa Street, Ermita. From the original white, they have been repainted bronze. 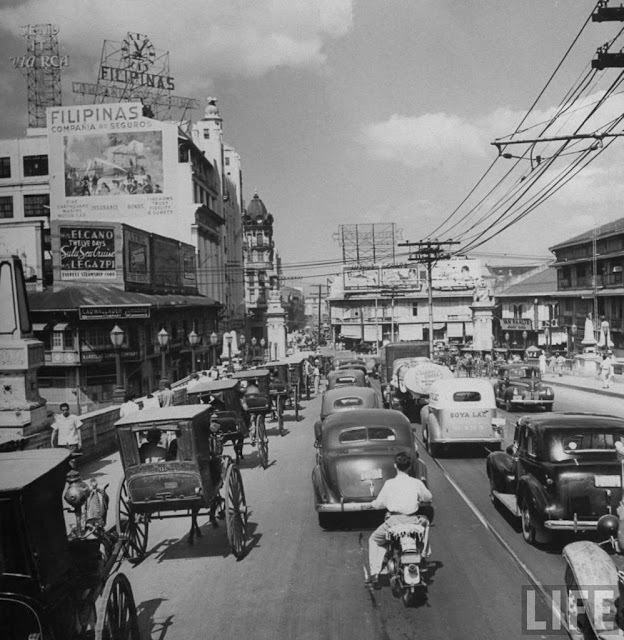 This was the the most European-ish angle of Manila. Look at the wide river side plazas! Very stunning. 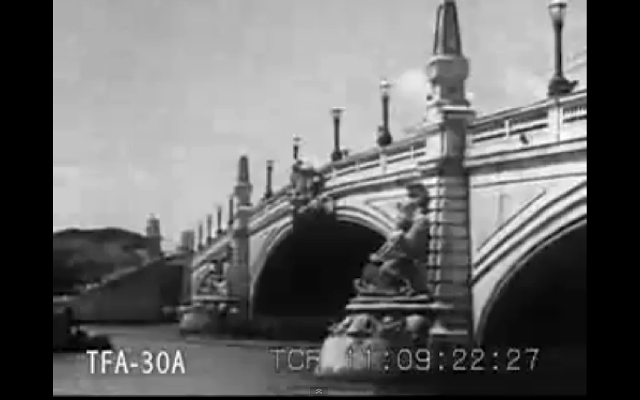 It's just sad that this was not maintained to this day and the bridge was not restored and was just built to just function without any design at all. Very DPWH! Hi. For everyone's info (plus the mod), the "missing" La Madre statue was hit by a shell, so that's why in the pic on the top of the (damaged) counterweight pedestal there is a rough something. I just want to thank you for this article. It is life changing for Filipinos living today. It is my dream to go back to the glory of Manila. It is my prayer that we have officials who will go back to history and respect our culture and preserve it for the next generation.